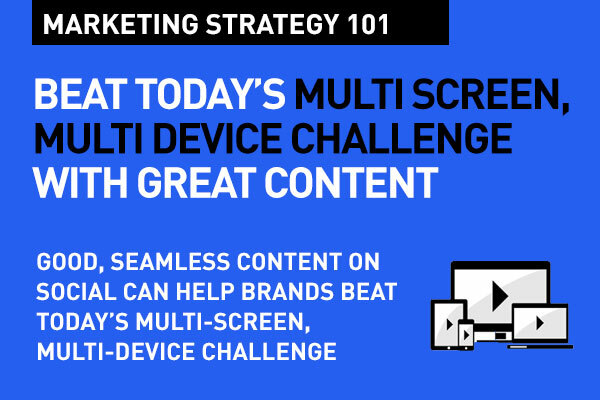 How can you understand and take advantage of today's multi screen multi device media habits? The tv watching experience is getting richer, better because of online? Rather than killing off tv in the living room, digital channels are adding to it, and broadening the perspective. 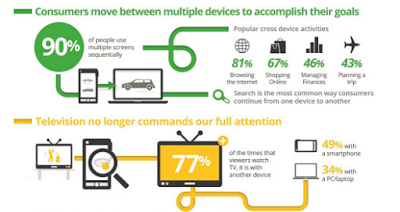 Consumers today are increasingly using multiple screens and devices while consuming media. With the boom in high speed access and the popularity of both tablet and mobile, people today aren't just watching tv. It's a combination of lean back (tv) and lean forward (tablet, mobile, laptop) in the living rooms of our region. Earlier on, the ad industry jumped at the idea of an increase in consumer engagement across multiple screens. Experience, participation, multi-platform engagement became buzzwords. What we blinked on was the fact that the proliferation of screens today fuels fragmentation – it causes consumer ADD – Attention Deficit Disorder. And we were caught dozing. Yes, it’s much easier to engage and hold attention in a conversation than in a monologue, but with some unforeseen pattern shifts, multi-screen engagement becomes a challenge. Consumer time and attention is getting lower as we move from traditional to digital (think banner blindness, low click through rates). Now as ‘digital’ is increasingly via mobile, small screens offer even smaller real estate for those of us planning to build engagement on. Multi screen marketing isn't new. But it's developing into a huge, synergistic platform where not only the message across what you watch on tv syncs with what's on your website, it does so at the same time, and with planned, timed and well-executed intent. We've always put an URL at the end of the tv spot, but now we're beginning to put in a Facebook address, and more often a Twitter hashtag. The twitter hashtag is to encourage immediate participation in sharing, in dialog, in comment fishing and more. In the UK, almost 70% of brands reviewed in a survey encouraged multi-device participation. Twitter themselves stated, "simply adding hashtags on air - or in ads - helps organise and steer the conversation." The Twitter report goes on to say, "in advertising, we're seeing that deeper integration of Twitter not only drives discovery and engagement but also drives increases in brand recall scores and other marketing goals." Twitter's increasing popularity and acceptance as a "code-sharing" medium with TV is linked to the open field nature of the microblog. It's so in the now and the instant. I watch a tv program, or a spot, and instantly am able to share my viewpoint using a hashtag (#) – and it's there for anyone to see. It's a bit more open than the Facebook walled garden where only my 'friends' can see what or react to my opinion. Red Bull in the UK did this very successfully with their #GivesYouWings campaign. 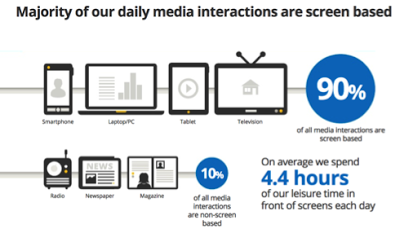 Ninety per cent of all media interactions are screen-based, and we spend around 4.5 hours of our leisure time in front of one screen or another. And we do this across multiple screens on multiple devices. Either sequentially, moving from one device to another at different times to complete tasks, or simultaneously – for complementary usage in a related activity or multi-tasking across unrelated activities. As consumers move seamlessly between devices, what really drives device choice is context: amount of time we have or need, what we want to really accomplish, where we are at that time, and our attitude or state of mind. Whatever the case, TV is no longer a singular focus activity. We tend to use another device nearly 80 per cent of the time we watch TV. What's even more interesting is that in a multi-device, multi-screen scenario in the living room, consumers tend not to get up and walk out during a commercial break. They stay engaged and busy, and connected. This works particularly well in "native" or "content marketing" campaigns that tend to want to engage the viewer in every possible way. Just adding a #Brandname at the end of your spot is not the way to go. The #whatever should be about the campaign, about the call to action, and about what you want the target audience to do. Using a slogan like Red Bull did in #GivesYouWings is the way to go. And multi-device or multi-screen marketing is not just for brands and products. Today's attention-divided consumer responds to a well-told, well-synced brand story that feels the same, regardless of where it is being consumed. They're interested and motivated to engage further when they see seamless continuity. Inconsistency of content style, inconsistency of message is what turns consumers off. Brands that succeed with multiscreen single campaign objective—increase awareness, hold attention, engage across platforms and screens, and deliver the same story across multiple touch points and screens. Start with analytics – first know about your consumer, about the audience you want to engage. The best way to start a well planned multiscreen marketing strategy is to have a grasp on what your consumer is all about. Customer or audience insight is key . Effective audience targeting can be achieved by using analytics that converts data from and about usage on any device to help brands increase their understanding of their audience and anticipate their next steps. And resolve what their audeinces are looking for at each stage, across each screen. Be screen-neutral in your thinking at first. Don't assume that tv is your starting point. Old school "multiscreen strategy" builds from TV as its base and presumes different objectives for each screen after that. Today, multiscreen can start anywhere – and it very often starts with Search. First of all, you just have to be there for your audience in Search . How you do that across screens is secondary. 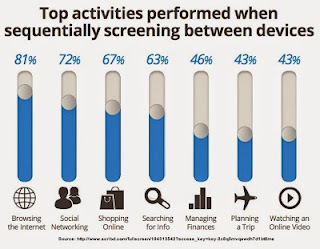 Remember that today's consumer jumps from screen to screen (sometimes at the same time) to achieve their goals. TV as we know it, is quickly evolving and becoming a larger experience. With multiscreen video, sharing, tweeting, in-the-instance interacting tv is becoming infinitely richer, increasingly interactive and delivering deeper levels of engagement. I agree that today multiple devices in the hands of the consumer poses some challenges for marketing experts, but as you have said, multiple screens being viewed may actually help the experience of tv - specially if a brand can support the program or ad on tv with related social content. Little confused on multi-device and multi-screen. Are they not the same? They are both same and different Camryn. People often consume content at the same time across two or more screens. They are doing this on two or more devices. They watch tv and then check social comments on the program on a tablet. That's an example of multi device and multi screen. Perhaps they are one and the same. On occasion, and on certain TVs, (smart TVs), you can split the screen between broadcast content and social on the side. That's single device multi screening.